As a child, our family was one of the first I knew to purchase a video player; it was a family Xmas present. My dad would painstakingly tape movies for us from the television pausing the recording through the ads so that we could watch a film straight through. 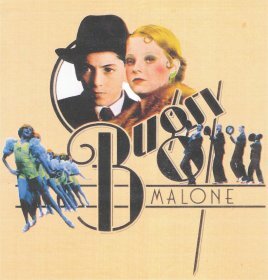 The movie that got the most screen time in our house was ‘Bugsy Malone’. My sisters and I were enamored with the depiction of prohibition and the speakeasies; the death-by-cream-pie and the old cars; and I was probably more than a little besotted by Scott Baio. More recently though, I can usually put on a DVD of ‘Whale Rider’ or ‘Juno’, ‘Benny & Joon’ or ‘The Shawshank Redemption’ and still be entertained and moved. What's on your never-get-sick-of list? Sadly Clueless is one that I have watched a hundred times. Others I love are The Princess bride and the very funny movie Blind Date. These movies may be old but have happy memories associated with them and leave me with a warm fuzzy feeling at the end which is what I want from my movie chill out time.